Polycystic ovary syndrome (PCOS) is the most common reason for infertility in women. It is a common health problem caused by an imbalance of reproductive hormones. The hormonal imbalance creates problems in the ovaries. As its name implies, it is a hormonal where numerous small cysts are formed in ovaries. Though there are no clear symptoms of PCOS but some signs are there that can predict about PCOS. 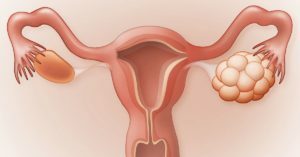 Irregular Menstrual Cycle: Women with PCOS may miss periods, may have fewer periods (fewer than eight in a year), or sometimes periods may initiate every 21 days or more often. Some women with PCOS stop having menstrual periods. Body Hair Growth: Women with PCOS may suffer from a condition where she has too much hair on the face, chin, or parts of the body where men usually have hair. This is called Hirsutism. Acne: Women with PCOS may have acne on the face, chest, and upper back. Hair Loss: PCOD can cause baldness on the scalp that is male-pattern baldness. Obesity: PCOS can cause sudden and excessive weight gain or difficulty losing weight. Darkening of Skin: PCOS can cause darkening skin particularly along neck creases, in the groin, and underneath breasts. Although the exact causes for PCOS are unknown, but results of a hormone imbalance caused by PCOS has deep impact in women’s brain and ovaries. A main underlying problem is a hormonal imbalance. The ovaries of women with PCOS produce more androgens than normal. Androgens are male hormones, but women also produce them in a limited amount. Inheritance: Genetics plays a role in PCOS. Women with PCOS are more likely to have a mother or sister with the condition. High levels of Androgens: Women with PCOS have more androgens than normal. Higher than normal androgen levels in women can prevent the ovaries from releasing an egg (ovulation) during each menstrual cycle. High Level of Insulin: Many women with PCOS have too much insulin, a hormone that turns food into energy. Having too much insulin may cause your body to make too much testosterone. How PCOS affects Fertility ? PCOS is one of the most common, but treatable, causes of infertility in women. In women with PCOS, the hormonal imbalance interferes with the growth and release of eggs from the ovaries (ovulation), and without ovulation there is no possibility of getting pregnant. PCOS can affect a women’s fertility in different ways. Ovulation problems are usually the primary cause of infertility in women with PCOS. Ovulation may not occur due to an increase in testosterone production or because follicles on the ovaries do not mature. Even if ovulation occurs, an imbalance in hormones may prevent the lining of the uterus from developing properly to allow for implantation of the mature egg.